Northwest National Real Estate: Sale Pending! Lincoln Montana Home! Sale Pending! Lincoln Montana Home! 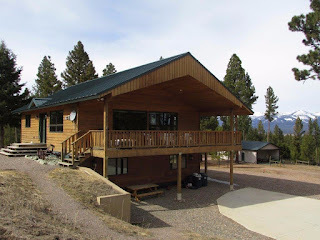 Lincoln, Montana home for sale on 20 acres with a shop. This property is ready for your horses. Enjoy the amazing mountain view from the deck, or through the picture windows. Just sit back with a cold drink and watch the deer and elk. 2280 square foot home that has 3 bedrooms, 2 full bathrooms, large kitchen, living room, and an office. Thousands of acres of National Forest only a couple miles away, and 2 wilderness areas; the Bob Marshall and Scape Goat Wilderness areas are just a short horse ride to the North! For you fly fishermen, the Blackfoot River is only 5 miles away, and the Missouri River is only 45 minutes away. Both rivers are Blue Ribbon Trout streams. The waters here are so pristine and clear you can see the fish as you float over them! This is a dream home for the person that has been looking for seclusion in the mountains in a great recreational area with easy year round access. Only $329,000 - Call Scott Joyner at 406-223-6039 for your own private showing.